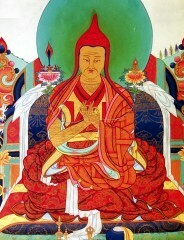 Jamgön Kongtrul Lodrö Tayé (Tib. འཇམ་མགོན་ཀོང་སྤྲུལ་བློ་གྲོས་མཐའ་ཡས་, Wyl. ‘jam mgon kong sprul blo gros mtha’ yas) (1813-1899) - widely known for synthesizing the knowledge and experience of the many lineages of Buddhism in Tibet. This synthesis is recorded in 'The Five Great Treasures'. He was recognized by all schools of Buddhism in Tibet as one of the greatest masters of the Rimé (ecumenical) movement, and is also known for writing and compiling one hundred volumes of teachings. His tertön name was Chimé Tennyi Yungdrung Lingpa (Wyl. 'chi med bstan gnyis g.yung drung gling pa). During empowerments he also received the secret names of Pema Garwang Trinlé Drodul Tsal, Pema Garwang Lodrö Tayé, and Pema Garwang Wangchuk Tsal. The sublime Kongtrul Yönten Gyatso (1813-1899) was born in the hidden valley of Rongyap, which lies in front of Pema Lhartse in Drida Zelmogang in Kongpo, East Tibet, in the Water Bird year of the fourteenth calendrical cycle. His father, was Tendzin Yungdrung of the royal Khyung clan of accomplished practitioners, and his mother was the yogini Tashi Tso. From his fifth year, he studied the basics of the alphabet and so on. Then, from the age of about ten, he began to study on an enormous scale and without sectarian bias, receiving teachings from many spiritual guides of various traditions, including Gyurme Thutob Namgyal of Shechen Monastery, Tai Situ Pema Nyinché Wangpo and Jamyang Khyentse Wangpo. He learned all the common sciences, such as Sanskrit grammar, logic and epistemology (pramana), arts and crafts, medicine and so on, and he studied, reflected and meditated upon all the uncommon topics of learning, including the Madhyamika, Prajnaparamita, Vinaya and Abhidharmakosha of the vehicle of characteristics, as well as the tantras, commentaries (Skt. agama) and pith instructions (Skt. upadesha) of the mantra vehicle, from both the kama and terma and both the old and new translation schools. In addition, he dedicated his whole life to teaching and spreading the Dharma, by giving empowerments, instructions, advice and reading transmissions for both sutra and mantra, kama and terma, old and new translation schools, without any sectarian bias. Finally, at the age of eighty-seven his physical manifestation was absorbed into absolute space. 1. The Treasury of Encyclopedic Knowledge, which brilliantly reveals the ground, path and fruition for the whole of sutra and mantra, from the paths of the common sciences all the way up to Dzogchen Atiyoga, which is the culmination of the nine vehicles in the uncommon approach. 2. The Treasury of Precious Instructions, which is a compilation of the most profound maturing empowerments and liberating instructions belonging to the eight great chariots of the practice lineage. 3. The Treasury of Kagyü Mantras, which is a compendium of mandala rituals, maturing empowerments and liberating instructions, such as Yangdak, Vajrakilaya and Yamantaka from the Nyingma kama, and the tantra cycles from the new translation lineages of Marpa and Ngok. 4. The Treasury of Precious Termas, which distills the quintessence of an ocean of profound termas within the Nyingma school. 5a) The Uncommon Treasury, which contains the unique secret treasures of his own profound terma revelations. 5b) The Treasury of Extensive Teachings, which includes various related works, such as praises and advice, as well as compositions on medicine, science and so on. The Torch of Certainty (Tib. ངེས་དོན་སྒྲོན་མེ་, Wyl. nges don sgron me), a commentary on the brief root text lhan cig skyes sbyor khrid by the Ninth Karmapa, Wangchuk Dorje, which contains instructions on the Kagyü preliminary practices and Mahamudra meditation. Only the first part has been translated and published under the title The Torch of Certainty (Boston: Shambhala, 1977, 2000). Changchub Shunglam, a commentary on the Seven Points of Mind Training. His students included lineage holders from the Kagyü school, headed by the Fourteenth and Fifteenth Karmapas and the Tenth and Eleventh Tai Situpas, as well as masters of the Sakya and Ngor traditions including Jamyang Loter Wangpo and Chöjé Kunga Jamyang, holders of the Early Translation teachings including Mipham Jamyang Namgyal and Tertön Sogyal Lerab Lingpa, and masters from the Riwo Gendenpa tradition, including Gyümé Khenpo Yeshe Gongphel and Drakyab Dongtrul Khechok Ngawang Damchö Gyatso. In short, his disciples were incredibly vast in number and came from all over Tibet, from the provinces of Ü and Tsang in Central Tibet and also from the upper, middle and lower regions of East Tibet. Jamgön Kongtrul had five immediate incarnations. Dzigar Kongtrul Lodrö Rabpel (1901?-c.1958). Nyoshul Khenpo, A Marvelous Garland of Rare Gems: Biographies of Masters of Awareness in the Dzogchen Lineage (Junction City: Padma Publications, 2005), pages 410-415. Ringu Tulku, The Ri-me Philosophy of Jamgön Kongtrul the Great (Boston & London: Shambhala Publications, 2006), '2. The Biography of Kongtrul Yönten Gyatso'. This page was last edited on 25 January 2017, at 21:04.